Easy to use, fully responsive WordPress Theme with clean design and lightweight code. Good choice for corporate, business, portfolio, ect. This template contains a lot of shortcodes and can be easily customized for any purpose. Few variations of pages allow to choose that option, which is better for your project. Laconic – perfect choice. Please, read our documentation. If you didn't find what you need, submit support ticket on https://qodearena.ticksy.com/ and our support agent will assist you with any question. If you already have WordPress installed on your server just skip to the next section. If you haven't yet installed WordPress on your server here you will find a complete guide on this topic. Just follow the steps and you will be ready in a blink of an eye with your shiny new WordPress website. Permalinks are the permanent URLs of your blog posts or pages on your WordPress site. We recommend to use "Post name" structure. However you can use any structure you like. You have two options how to upload themes in Wordpress and I will cover them both now. 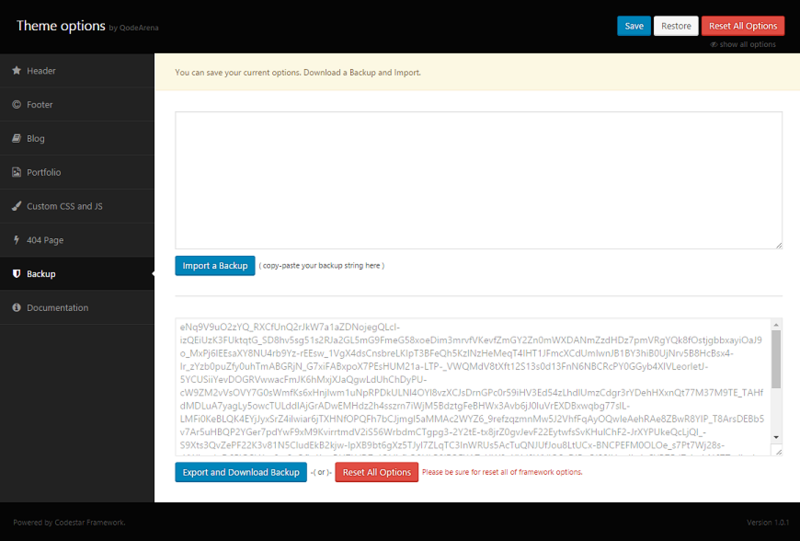 You can either upload all theme files via FTP or you can use Wordpress Theme Uploader. It really doesn't matter at all which one of these techniques you want to use, so choose the one which seems to make more sense to you. So I assume you do know how to use your FTP client of choice (like Filezilla), but if you don't, then try Theme Uploader method. First login with your FTP account and navigate to your Wordpress installation directory and in there go to wp-content/themes folder. Now put FTP client to side for a while and head back to Laconic Theme folder, which you just unzipped laconic.zip. There should be only one folder, called laconic. To make sure you are in the right place, check that folder contains files like index.php, functions.php and style.css. If everything looks good you are ready to upload this laconic folder to wp-content/themes, which you found earlier. Navigate to Appearance -> Themes -> Add New -> Upload Theme. Select laconic.zip file. Press the Install Now button to upload and install the theme. After theme activation you will see setup wizard - tool that will help you with installing theme required plugins and importing demo content. Please, be patient. Import process can take up to to 20 minutes. Here you will see suggestion to use child theme for any theme customization. Using it you will save all your changes, even if main theme will be updated. That's all. In a few minutes your all plugins were installed, demo data imported and website looks now same as on demo! Now go in Appearance -> Menus and select "Laconic menu" as Top Menu. A WordPress child theme takes the functionality of another theme, named parent theme. It gives you the possibility to customize an existing theme. Instead of modifying the theme files directly, you can activate the child theme and work within it. All customizations are stored in the child theme and anything in the child takes priority over the parent. So if the same file exist in both child and parent, the file from the child will control that aspect of the theme. Working with child themes, your customizations are safeguarded from future upgrades because you only upgrade the parent theme, which you never edit, while the customizations are protected in your child theme which you don’t upgrade. Safe Updates. You can easily modify your website using child themes without ever changing the parent theme. When a new version of the parent theme appears, you can safely update it as all your modifications are saved in the child theme. Easy to Extend. A child theme has a great flexibility. It does not require writing a lot of code. You can modify only those template files and functions that you need. Notice! When you install one of our themes you must upload both parent and child theme folders to /wp-content/themes/ but you should only activate the Child theme via Appearance > Themes. While you should never edit files in your Parent theme, if you really must, the safest way to do it is to download a copy of the file you want to modify on your computer, make the changes, and then upload it into your child theme folder. This way of modifying the files can be used for any files from the parent theme — note that you must re-create the same folder structure in your child theme that exist in the parent theme in order for the modifications to take effect. There are two ways to update Antica theme: via FTP or in WordPress dashboard. Before updating please backup your website! Go to Themeforest site, open Downloads section. 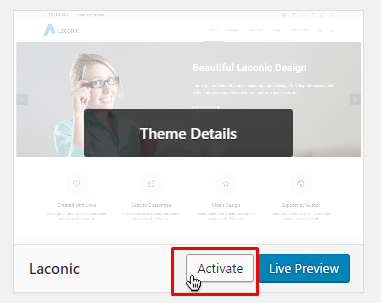 See in the list Laconic - Business/Corporate WordPress Theme, click on the Download button, from dropdown select Installable WordPress file only. Upload, install and activate latest version. After theme will be activated, setup wizard will run. Tap "Lets' Go". Next step is updating theme required plugins. Click "Continue" and wizard will update plugin(s). 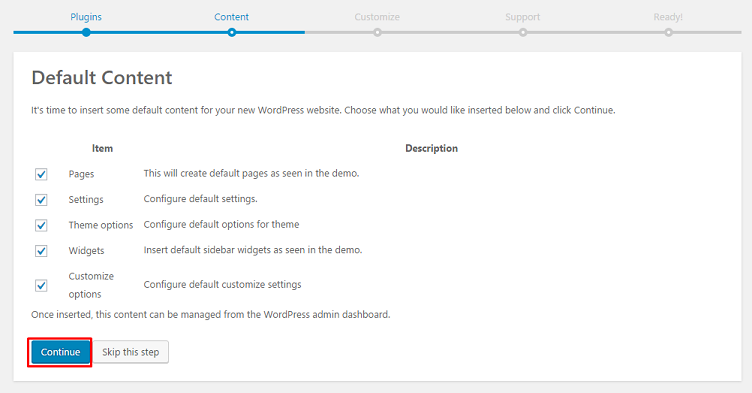 After updating required plugin(s), skip Default Content and Theme Customization step. Premium plugin are not trial, they are full versions that you can use as long as you want. We have agreement and permission from plugins' authors to provide these plugins with theme for free. So if you will see notification meesage like "Hi! Would you like to activate your version of Revolution Slider to receive live updates & get premium support?" - ignore this message or, if you want direct support and updates from plugin's author - you can purchase this plugin. 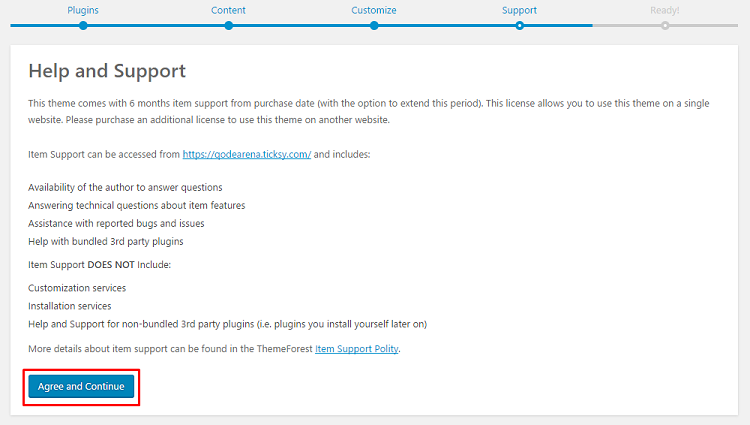 All premium plugins are updated with theme update. So, if you will see that there is a new plugin version, please, be patient and wait for next theme update. Antica is translation-ready theme. We will show you how to translate our theme. 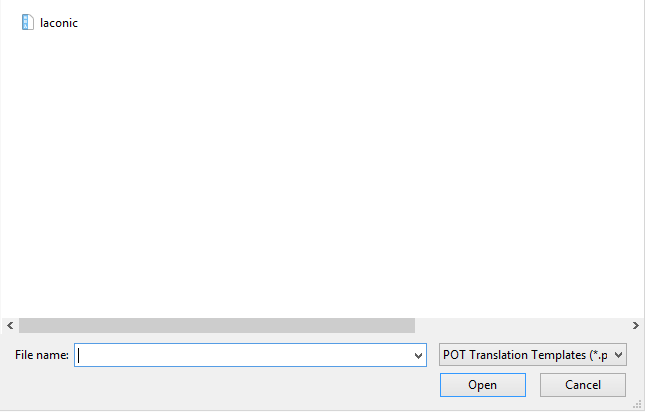 .pot: This file is a “portable object template” that contains all of the text to be translated. It doesn’t contain the translations themselves. .po: The “portable object” file contains the original text and the translations. It’s the file we’re about to show you how to edit. .mo: This is the “machine object file.” When your translation is complete, you will convert or export your .po file to this file type so that WordPress can use it. There are a lot of translation editors. The most popular is Poedit. It is very easy to use and we will show you how theme could be translated. 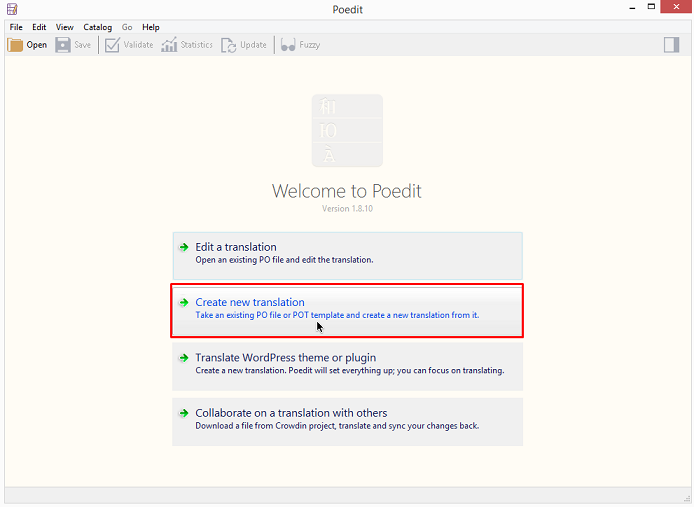 Click the “Create new translation" in Poedit and browse .pot file for our theme. You should be able to find it in the folder titled “languages” in the theme folder. Poedit saves your translation according to the language and an associated country (for localization). The resulting .po file will be titled according to abbreviations for the language and associated country. In our case, we’re using German, so our file will be de_DE.po. Translate theme words you need. Save .po and .mo files. When you save your new .po file from Poedit, the application automatically generates an additional .mo file and saves it in the same directory on your hard drive. After renaming the files, use an FTP client to upload both files to the wp-content/languages/themes folder in your theme’s directory. Now you just have to tell WordPress to use the translation you created. If you will save .po and .mo files in theme folder (wp-content/themes/laconic/languages/) after theme update these files will be removed. So backup these files before theme update. 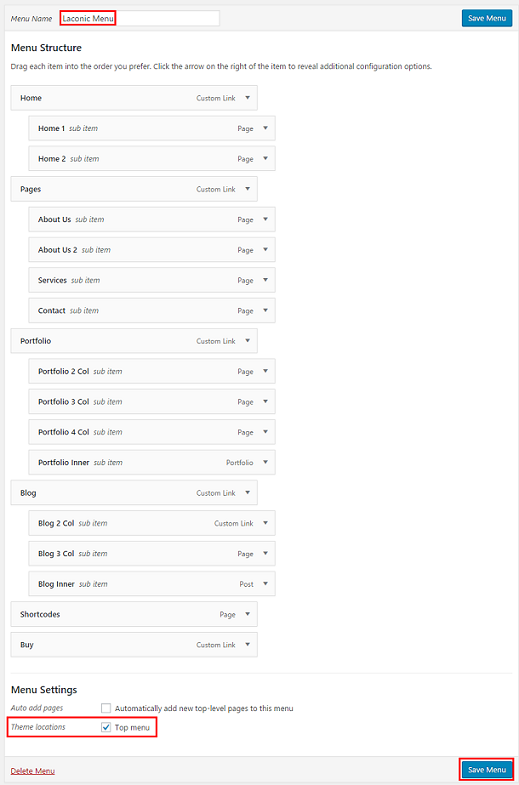 In "Theme Options" you are able to change main theme settings for Header, Footer, Blog, etc..
Notice: Before leaving the 'Theme Options' tab make sure to click the 'Save changes' button at the top of the panel, otherwise your changes will be lost. Here you can customize header: logo, social links, etc. In this section you can change footer settings. In this section you can find settings for posts page. Settings for single portfolio page. Backup, import and export your "Theme Options" settings.